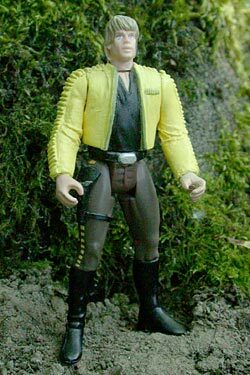 This was my very first Star Wars custom way back in 1997. This has always been my favorite Luke variation. I made him before I discovered the magic of Sculpey for adding details. Needless to say, it's a little rough. I used a Han Carb as the base. I added the jacket by building up layers of Kleenex dipped in white glue, then coated with polyurethane. This gave a good look to the folds on the arms, something I haven't been able to do as well with Sculpey. The jacket ribbing was sculpted on with green Squadron model putty. I sanded the whole thing quite a bit but it's still pretty rough. The holster was cast from ANH Han's leg, and the strap is a strip of styrene.